Going through more of my old artwork, I found a picture that I kinda/sorta forgot about. My memory is a bit more messed up than I let on, so forgive me for fudging the details here. One of my aunts (Louise?) 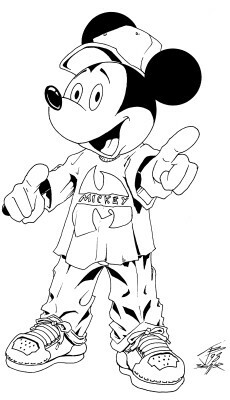 wanted me to draw a picture of Mickey Mouse in Hip-Hop clothing for the grandkids’ guest room. It had to be postersized and I’d lost the skill to draw at that size after high-school. So I decided that I was going to draw it small and blow it up at Kinko’s. Now, I don’t really draw other people’s cartoony as much as I did as a kid, so this version of the Disney mascot looks… pretty off. Seeing as how I did this in 1998, it could’ve been a lot worse. But if there’s one thing that I’m proud of in it, it’s getting another chance to put a Wu-Tang logo into something. Anyway, it all turned out to be for nothing because I couldn’t get it copied due to it being a Disney character. The person behind the counter told me a story about how Disney would send people to copy shops to try and copy Disney pictures and the ones who did were arrested and rocketed into the sun. Well, not really, but they got in big, big trouble or something like that. Back then, I had a habit of hiding things in a lot of backgrounds, especially graphitti. Everything from my friends’ names to Mr. Yuk. But more than anything else, you’d see the Wu-Tang logo. After getting that Protect Ya Neck/Method Man single, every pic that I drew with graphitti had a Wu-Tang logo somewhere in it. Sure, sometimes you’d have to squint like an MF’er, but it’s there. There’s a lot more than the ones I just linked to, but they’re even more embarassingly bad. Mickey Mouse © the Walt Disney company. Mickey used without permission and in the name of fan art. No claims to the mouse are being made here. Please… don’t kill me.